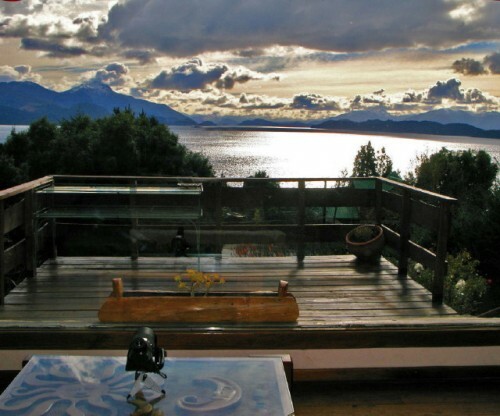 LivingInPatagonia.com » Blog Archive » ¡Te extraño Argentina! As many of our readers know, Shanie and I left Argentina as full time residents back in October, 2010. Here it is almost 2 years removed from la vida loca, and I find myself reflecting back on my beautiful time there. Many things have changed since crossing over the equator, but one thing has remained constant. My experiences in Argentina continue to be on my mind, especially when I’m waiting in line, jaja. En serio, I am so grateful for having the opportunity to call both Salto de Las Rosas and Llao Llao home. Both chapters were full of amazing life experiences that have made me a better person. The friends I made and the culture that I embraced will forever be cherished. I sometimes close my eyes and can remember this view, from the old living room. Argentina, you will forever be close in my heart! Recuerdos, lindo recuerdos que forman parte de nuestras vidas. Thanks for your words and for sharing your thoughts and feelings with us!!! it was great to be your vecina in llao llao, u and Shanie really made a difference in my time in bariloche. it was great to work for BVR and I am really happy to have shared time with u 2 and the doggies. Bon article, merci !!! De mon coté, je me suis interessé a comment faire pour gagner plus d argent aussi. I every time emailed this webpage post page to all my friends, as if like to read it afterward my contacts will too. What’s up i am kavin, its my first time to commenting anyplace, when i read this article i thought i could also create comment due to this sensible article. What’s up to every one, it’s in fact a pleasant for me to pay a visit this web page, it includes helpful Information. Thank you for some other fantastic article. Where else may anybody get that type of info in such an ideal approach of writing? visiting this site dailly and obtain pleasant data from here everyday. visiting this website and be updated with the most recent news update posted here. This recently renovated casino is one of the nicest in the state. Lovely Web site, Carry on the fantastic work. Thank you so much!. provided that I provide credit and sources to your website? genuinely reap the benefits of some of the information you provide here. Please tell me if this alright along with you. Many thanks! Great information. Lucky me I ran across your blog site unintentionally (stumbleupon). I’ve saved like a favorite for later! Computer games are beginning to have a growing popularity among children every year. The increasingly addictive effect of computer games prompts parents to worry about the negative effects of games on children. In the friv game site, children are playing games, as well as mathematical games that will help their lessons alongside games. These games contribute to children’s intelligent development. It is useful to know the best-selling game throughout the history of the game before going into depth. Mario is one of the best-selling computer games and has sold over 210 million units worldwide. friv 2 mario character has been in more than 200 votes. Today two-thirds of the American population is playing computer games. These games first appeared in the 1970s and became a source of fun and learning for both children and adults. Nintendo, PlayStation, or Wii games can be found in categories such as action, adventure, sports, entertainment, adult and education. Since the design of computer games, a comprehensive research has been launched on the effects of these games on children. These studies have revealed that the games have both good and bad effects, that the children change their gameplay according to their ages and the time they spend on games. Friv games have a positive effect on people. There are also cases where computer games have a positive effect on children. When playing computer games, children gain problem-solving skills, learn how to work in teams, and the perception becomes clearer. It also helps short-term memory grow. Playing computer games requires faster and more accurate decisions, so that decision-making skills improve. Hyperactive children are in a hurry and are forced to concentrate on the work they do. They can not use their intelligence because they can not watch the lesson because they can not sit at the beginning of the book. Attention can be used for the treatment of computer games for anyone who has little difficulty collecting. It is inconvenient that the only interest of the child is a computer. But it is important for the academic success of the child to use the computer in developing the mind.Do not let children learn violence on a computer, but use your energy to discover something. This should not be forgotten; Domestic violence is more harmful than violence on the computer.